Southern fried food was never my thing. Not a huge fan of Popeye's or KFC or anything fried to say the least. But, I did buy a Living Social deal for Kiss My Grits a year ago, and it was expiring in a week. It was a great deal I couldn't pass up ($15 for $30), plus they had just recently opened when I first purchased it. You know me, I like to try anything new! We showed up around 745pm (they close at 9am), and there were a few groups waiting outside. I didn't know this place was that popular, but it was crowded. When we finally got seated, the first thing that came out of our waitress' mouth was "Living Social deal?" I guess everyone else who had bought the deal and procrastinated were trying to use it before it expired too! After that, we started off with two Sweet Teas that came both in matching Mason Jars. Very cool. So what'd we eat? I surely didn't want chicken, and was looking at their Pimiento Grilled Cheese, but that seemed so unauthentic and boring. I could get Grilled Cheese anywhere. I asked our waitress what she recommended- some highlights of their menu. She mentioned the Dixie Chicken if I wanted something more along the lines of Breakfast (comes with a scrambled egg), or the Meat-In-3 with Ribs/Catfish/Chicken, or the Catfish Plate which was her favorite. And of course, how could you go wrong with Chicken and Waffles!? I gave in and settled on the Dixie Chicken. I know, I know, Fried Chicken...but I figured I had to try something really Southern-Authentic! Brian settled on the Chicken and Waffles, and boy, when that thing showed up, it was GIGANTIC. Let me just say that if you order this, please make sure you are hungry and have a big appetite...or definitely, share. I also wanted to try their Smoky Mac N Cheese that our waitress said we "MUST" try, and of course, I can never pass up Mac N Cheese! I wanted to also get some sides of Hushpuppies and Candied Yams, but we passed on those to save some room for dessert. I heard the Bread Pudding was delectable topped with Bourbon sauce. Mmmm! So, to be completely honest, I wasn't looking forward to this. All I could think was "fried food," but in the end, everything turned out to be really amazing. The portions were large, and you definitely got your money's worth. The Dixie Chicken was a good choice. Chicken was moist and the sauce was so creamy! My favorite, though, was their Smoky Mac N Cheese. AMAZING. One of the best I've had. Comes topped with crunchy Onion Rings and a big 'ol spoon dropped right in there, pointing to the heavens. Brian also loved the Chicken and Waffles. I must say, my favorite part of that dish was the waffles! Slightly crispy on the outside and mighty soft and chewy on the inside! Spread with butter, douse with syrup, and you got dessert right there! Ok, so maybe we had two desserts. The waffles and then came the Bread Pudding I wanted to try, equipped with lots of whipped cream! Soft, buttery, with big chunks of pound cake and buttermilk biscuits. Loved that there was a hint of cinnamon and also raisins, and then my favorite, the bourbon sauce. That really made it! Just wanted to say a small snippet for the service. We didn't get our waitress' name, but I have to say she was one of the best! She was patient, enthusiastic, and walked us through the menu. She gave us extra sauce, explained what a "cathead biscuit" is, and refilled our Sweet Tea constantly. And even though we were the last patrons, and we could tell the staff was tired, she never rushed us. Service was excellent here! All in all, I have to say, this Living Social deal outing was a major success. Turned out to be quite the little gem tucked away in Puck's Alley. I highly recommend if you are craving some downright delicious Fried Chicken, Waffles and Sweet Tea! What makes this place special and different from any other restaurant, Southern or not? Everything here is made from scratch "From the pork sausage, to the cathead biscuits, and every last delicious dessert." 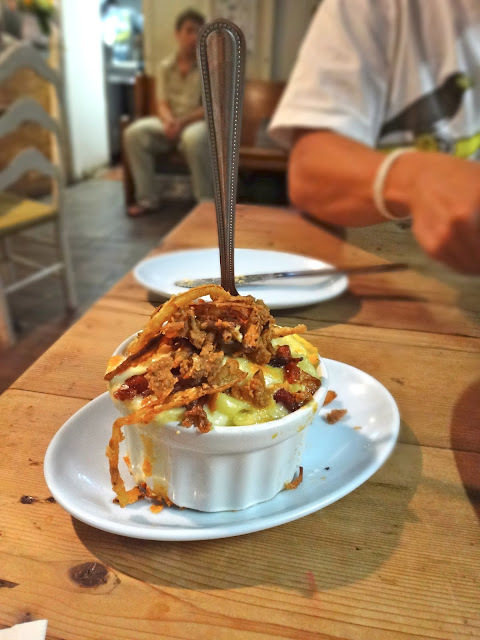 Smoky Mac N Cheese topped with onions! Mashed Potatoes with Gravy- one side comes with the Chicken and Waffles! We shut the place down! Too much food.